Meyer Aquascapes provides water feature installation in Cincinnati, Ohio. We take a look at some of our favorite water feature installations and designs. 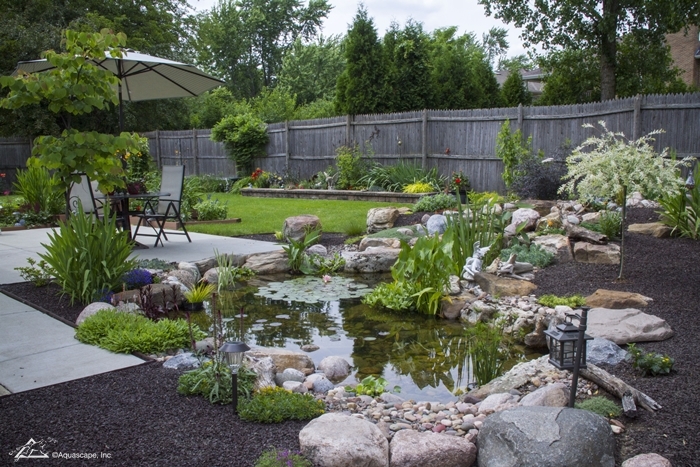 Taking pride in our beautiful water features for over 30 years, we install small water features, large water features, commercial water features, and backyard water features. If you have something in mind, we will work with you on the water feature design, installation and maintenance! When we design a new water feature, we take into account a multitude of factors. We will want to look at where the water feature installation will ideally happen at. We’ll take note of particular features you’d like to place to complement the overall design, and how these other water features will be placed around the primary feature. 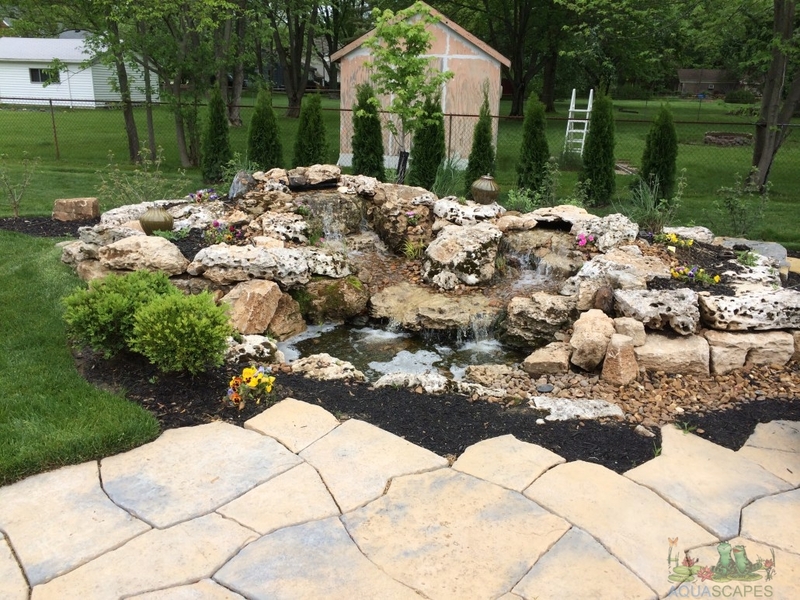 Whether waterfalls, streams, or even fountains are coming to mind when you think of your paradise, we will make sure they work well together in the overall attractiveness of your new water feature install! Some of these water garden ideas that we discuss on our blog can be difficult to grasp, such as water feature aeration for example. Fortunately we are water feature installation experts and can guide you through the process so that you can enjoy your feature year after year. Many of our kits are DIY and can easily be put together to enhance the water feature. If you’d like to install your own water feature, you can do that with our water feature installation DIY kit. This kit specifically includes a waterfall! We’re just a phone call away for any question you may have; we love helping water feature owners. Water feature installations in the suburbs are one of our favorite kinds of installs. 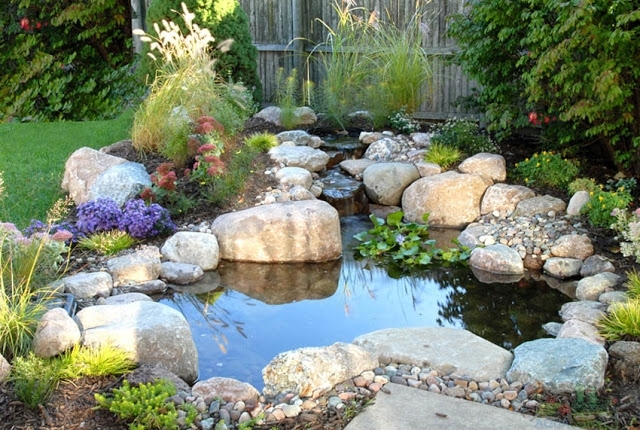 These features must be compact to fit into a small backyard, but large enough to display the various features the water garden will ideally have. 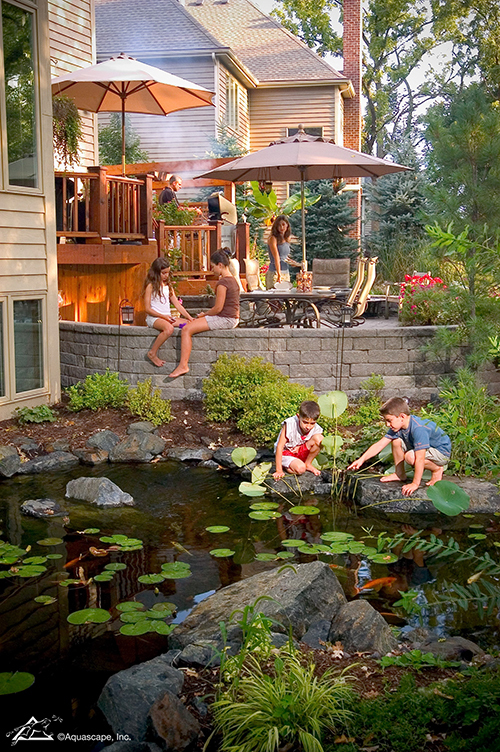 Many of our customers have gone the route of a pondless waterfall feature for this very reason. They want something that can easy fit into the corner of their yard and requires less maintenance than an attached pond. If your backyard is tight on space and can’t fit a large water feature installation, consider a pondless waterfall install! Water feature installations improve the value of property and add beauty! This property value increase along with the stunning beauty of a water feature installation leaves most of our customers with only one difficult decision; where do we install the water feature? 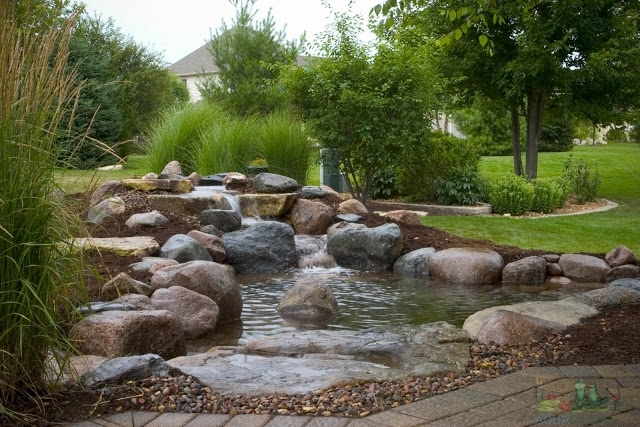 When considering the placement of the water feature installation, remember the pondless waterfall idea. 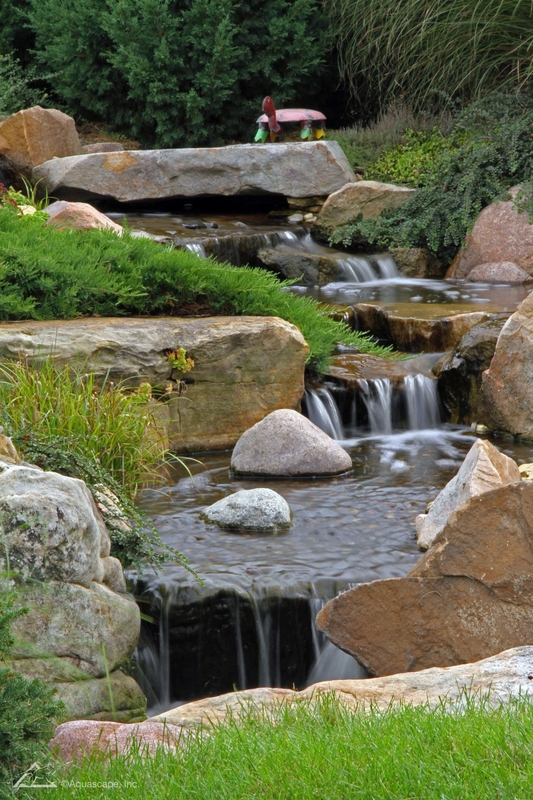 You can add a stream going down the side of your property with a pond at the end of the stream, or simply just a waterfall flowing into a bed of pebbles. Water feature installation ideas are endless. 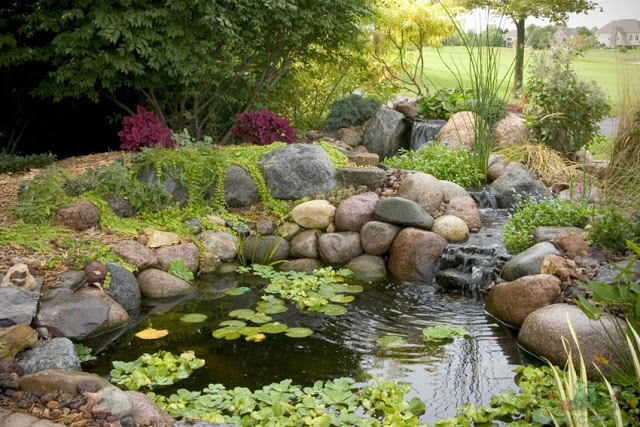 Sometimes something as simple as a waterfall flowing into a pond will be all that’s needed to spice up your backyard. Many of our customers choose to go the route of a water feature installation with a pond attached so they can house a variety of exotic fish, turtles and other wildlife. Many subdivisions and companies hire us to install a water feature near their entrance so that their customers can enjoy the beauty of a water garden. When a company comes to us to install a water feature, we take their installation just as serious as any other water feature installation. We love to promote their company image with a stunning aquascape! Many of our residential water feature installations have included vegetation to compliment the design. 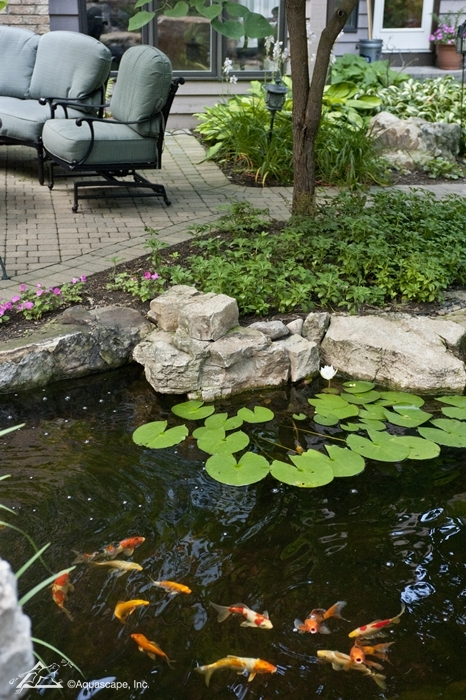 Adding in a variety of colors, or plenty of earthy tones can bring about the perfect water feature to relax next to! We’ll help you identify where to best place seating around your residential water feature installation. Sometimes a simple bench or lawn seating is all that’s needed, but sometimes more is necessary! We start by asking the right questions that are most important to you. What parts of the water feature installation are you worried about, if any? 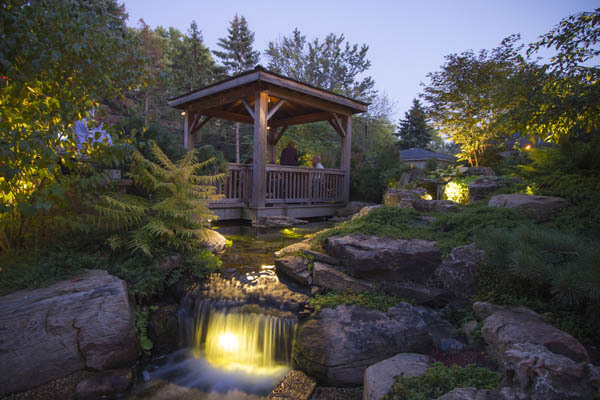 Whether we are on the job installing your water feature, or maintaining the pond year after year, we will be here for you for your every question! 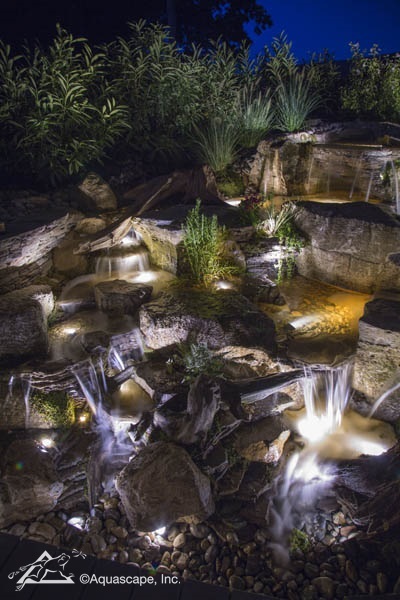 When we install a new water feature we examine opportunities for lighting. Would accent lighting around the water feature install be appropriate? What if we added waterfall lighting on a timer? Ideally you will be able to enjoy water garden anytime you wish, and with water feature lighting installed, you have that option!